How to Take Care of Granite Countertops? Your kitchen is one of the most special corners of your house as it is not only the place where you spend hours together every day but also perform one of the most essential household activities which are cooking. Naturally, kitchens should not only be aesthetically pleasing but also functional and since countertops cover the major portion of this space, you have to give a lot of consideration before choosing the right material for it. 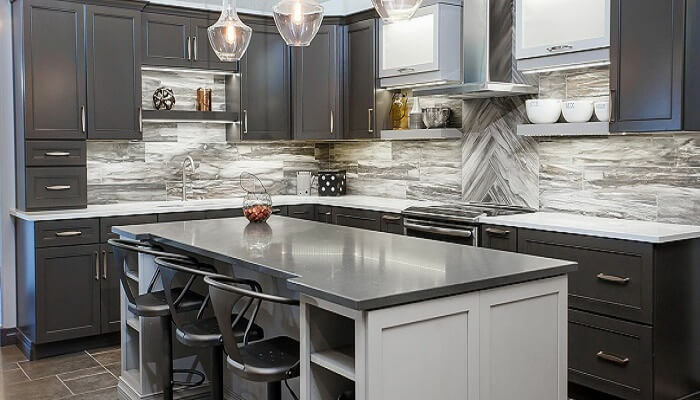 While there are lots of popular countertop materials in the market, today, like the quality marble or quartz countertop options, granite worktops still stand out for their magnificent looks and superior durability and functionality. If you take good care of your granite countertops, then they can last for years together and still look as new as the day they were installed. So here are some tips that will help you to take care of your granite worktops. Seal Your Granite Worktops – Granite being somewhat absorbent is prone to staining. That is why it is essential that you use a high-quality granite sealer that can make the counters completely dry. Use a Soft Cloth and pH Neutral Cleaner – You should not use hard chemicals or abrasive scrubbers for cleaning granite. Though granite is quite long-lasting, the acidic spongers and cleaners can scratch or wear away the sealant. Hence you need to steer clear of the vinegar or windex or use pH neutral soap for cleaning the countertops. Simple dish soap, as well as stone cleaners, work in this case. Go for Daily Cleaning – You need to clean the granite worktops on a daily basis. You should first rinse the worktop with clean water and then dry it with a cloth that is soft. You can just use a few drops of dish-washing soap and a damp cloth in this case. There is no need to use specialty cleaner or chemicals every day. Blot Up the Spills Immediately – In case you spill anything on the surface, you should blot up with a soft cloth or paper towel right away. You should not keep and let the spilled liquids like milk or juice because they can spread around the countertop. Opt for Deep Cleaning – If your granite is sealed in a proper way and maintained then you can use a rag, water and gentle cleaner to wipe it. For water-based marks like coffee, juice and wine, mix up baking soda and hydrogen peroxide and make a paste. Then apply it on water-based marks and let it sit overnight after covering it. For oil-based marks like that of grease or milk, make a paste in a similar way with water and baking soda, apply it on the marks, cover it and let it sit overnight. Though granite repels bacteria by itself, you can still use 91% isopropyl alcohol and water and after mixing it in a 50:50 ratio spray it and rinse with water after letting it sit for 3-5 minutes. Dry with a soft dishcloth afterward. Avoid Cutting Directly on Granite – Though granite is tough if you don’t use the cutting board it can lead to scratches. Also, you should remove diamond rings before working on granite as a diamond is harder than granite and can scratch the granite. Avoid Hot Pans on Granite and Use Coasters for Liquids – Though granite can withstand high temperatures, constant exposure to extreme temperature can ruin the surface. So, don’t leave hot pans on the surface of granite directly for prolonged time especially in a chilly room. You should also protect the granite from absorption of moisture especially in case of dark-colored liquids like juice or wine by using coasters. Just like the new quartz countertops, granite worktops can enhance your kitchen eccentrics and functionality to a great extent. Just with a little care, you can ensure that they can keep using it year after year without any issue.